"Computer servers are at least as great a threat to the climate as SUVs or the global aviation industry," New Scientist reports. One server alone, we read, has the "same carbon footprint as your average SUV doing 15 miles to the gallon. Yet, whereas the SUV is seen as a villain from the environmental perspective, the server is not." Note, meanwhile, that I have not independently verified these numbers; I am simply repeating someone else's claims. As Money explained last summer, these "server farms" and "data centers" can each use up to "a small city's worth of electricity" – and most of that electricity goes toward "cranking up the air conditioning to make sure the computers don't literally melt themselves into slag." Returning to New Scientist, we read that, "with more than 1 million computers on the planet, the global IT sector is responsible for about 2% of human carbon dioxide emissions each year – a similar figure to the global airline industry." So what to do? Do we make our server farms hydroelectric? It's already happening. Do we make them wind-powered? Already happening. Do we go solar? That's happening, too. As Business 2.0 wrote back in October: "Massive data centers are vital to the economy. They are also notorious power hogs. If their numbers keep growing at the expected rate, the United States alone will need nearly a dozen new power plants by 2011 just to keep the data flowing, according to the Environmental Protection Agency." That's why a small server-farm company called AISO.net (for "affordable Internet services online") has gone completely off the grid. Located 80 miles southeast of Los Angeles in the desert hamlet of Romoland, AISO.net has flanked its 2,000-square-foot building with two banks of ground-mounted solar panels, which generate 12 kilowatts of electricity. Batteries store the juice for nighttime operation. However, couldn't we also just store less information, save two or three – or four – hundred fewer emails, stop being mouse potatoes and go outside for a walk, leaving our servers turned off in the darkness? Sure – or we could build our server farms in Iceland, where geothermal and hydroelectric power is easy enough to find. In any case, I can't help but wonder if the ecological effects of this archival instinct to preserve the past at any cost – whether we store something inside air conditioned warehouses full of books that no one wants, or in the well-lit galleries of potentially unnecessary new museums, or even out on server farms somewhere in the rainy hills of Oregon – are really worth it. And I can't help but suggest that they're not – even if that means I'll no longer have a place to save BLDGBLOG. But we are making the earth unearthly, through the knock-on effects of global climate change, in order that we might hold onto the human past for another generation – reading old books, preserving films, saving emails. 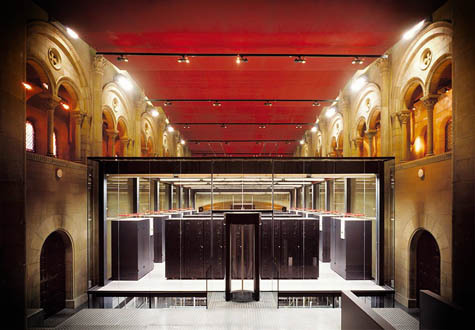 [Image: The Mare Nostrum supercomputer, Spain; this is not a server room]. So is the anthropological project of preserving ourselves really worth its environmental effects? Are we saying that the planet may soon become unrecognizable, even uninhabitable, because of runaway climate change, and yet at least it'll have lots of really great archives...? Is this the long-term historical irony of humanism – with its museums and libraries, its institutionalized nostalgia – that all these air conditioned warehouses and rural server farms don't represent the indefinite continuation of the humanist project but, rather, that project's future ecological demise? (Read more about "green" server farms over on Worldchanging. See also the previous post). Apples and oranges comparing servers to SUVs. Read the last comment after the article about how little power it takes to store a lot of information. 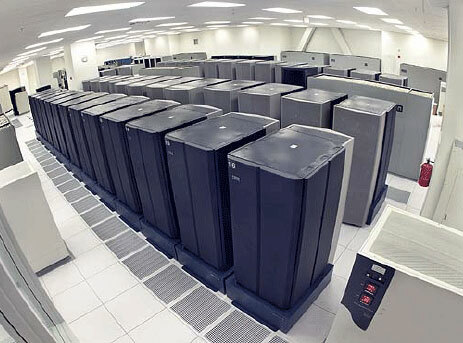 Think instead of how much paper information these server farms displace. one could press their server vendor to reduce electricity usage; Sun's CoolThread servers use WAY less power than an equivalent solution from any other vendor with just as much processing power. I don't work for Sun or a Sun hardware vendor; I'm just *that* impressed with their CoolThreads servers that it is hard not to list their virtues at every opportunity. i don't believe we'll be served by trying to continually reduce our use of technologies as we invent them. Nah, I am no expert, but I know from my own disc usage that video takes far more room than anything else, way more. Mentos and Pepsi experiments and funny cat videos probably make up a fair percentage of the total load. TV shows and movies and their attendant commercials fill the server farms and will multiply many times very soon. Time to make it a national defense priority to find other ways to cool computers. Right after we rebuild the transit system that has been neglected for 50 years so we could allow our presidents to play policeman around the world. I'm scared of the heat and noise generated by my PC alone. I feel relieved everytime I turn it off. "more than 1 million computers on the planet"
That should be billion; it is in the original article, and 1 million is ridiculously low. BUT aren't new computer technologies being developed using nanotubes that would eradicate the heat generation and thus the need for cooling and thus the huge emissions? The solution is simple: go back to the mainframe (much more efficient than distributed stuff), get rid of layered code (perfect example is Web 2.0 mashups) and GUI's (green screens are more frugal). PS: I actually visited the Mare Nostrum and it IS a computer room, albeit built in the former chapel of the University of Barcelona. The power consumption is not driven by the amount of information, which can be stored indefinitely without power. Active uses consume power, whether that's simply moving information from one place to another, or other transformations. Steve has it right: One can't do a complete bookkeeping solely from direct costs of our choices. We also need to examine the costs avoided. We can move information without moving matter. On the other hand, we need to look at more than just energy consumption. Computer hardware is depreciated and cycled out every 3 years. What about the full lifecycle costs? Electronic waste is a growing problem for which we need long-term solutions. On the energy consumption side, technological advances continue to reduce power consumption per unit of work: cycles, instructions, bytes, what have you. There is a theoretical limit, the entropy of information loss, to how low it can get. But we've a long way to go before we hit that wall. I enjoyed your post. But I do see one important flaw in your thinking. One of the primary reasons we are developing a solid understanding of global warming is because we have an archive of information to compare with current observations. Here and a million times a day the growing archive proves its worth. What value are funny cat videos? Who knows. To a veterinarian with a revolutionary idea maybe they'll be pivotal. Neither should we underestimate the value of simple joy. If the tendency to archive is instinctual we should respect that and save as much as we can. There's no sense saving everything if we go extinct doing it, so you're absolutely right reducing the environmental cost is paramount. Thankfully lot's of companies are working on this problem but why stop there? Why shouldn't the benefit of archiving be achieved by virtue of a different benefit? That's certainly how Nature would solve it. Can information be stored in the equivalent of a nut? Can we write our archives in binary code into DNA/RNA and power it by photosynthesis? Why the hell not - look at all the other miracles that surround us. No one can solve a problem they are unaware of so I hope you will continue to post to BLDGBLOG - perhaps with increased awareness that it provides a catalyst to a community and that it is communities that will solve the complex problems we face. A single SUV is a 1.5 ton metal frame with a inefficient and unenvironmental gas engine that transports 100KG of man meat lazy enough to think that an over sized tractor is actually cool to be seen in. A single server is an information storage and distribution device that serves tens of thousands of people at the time at maximum efficiency.